“It’s better to be a foreigner in Hanoi. When they learn you’re from Ho Chi Minh because of your accent, they charge you more.” Interestingly, there’s this apparent north-south divide in Vietnam. Funny how conversations can range from guy stuff to serious topics like this one during drinking sessions. I find the drinking culture of Vietnam pretty unique. It’s all about service they say. So don’t be surprised when the waiters or waitresses would keep on refilling your drink and replacing the ice. Their “beer chow,” or food taken with drinks or “pulutan” in Filipino, is meat with generous helpings of vegetables. And they end the drinks with a dessert of fresh fruits! For the record, I don’t drink so I just helped myself with all the food. I love how every meal here is not complete without greens and herbs adding rich flavor to every dish. I hope they maintain this and not give in to the invading fast food culture. It’s been five years since the last time I was in Ho Chi Minh. Now, you can barely see the “old” Vietnam as it’s transitioning fast to the western way of development. It’s sad how we set that as the standard. Coffee shops are everywhere and there used to be no Starbucks anywhere but that’s no longer the case. I noticed how they use a lot of plastic cups and straws and these drinks are further placed in plastic bags. It’s no wonder how Vietnam, like the Philippines, is one of the top plastic polluters in the world. We visited the usual tourist spots – the Saigon Notre-Dame Basilica, Ben Thanh Market, and some museums. 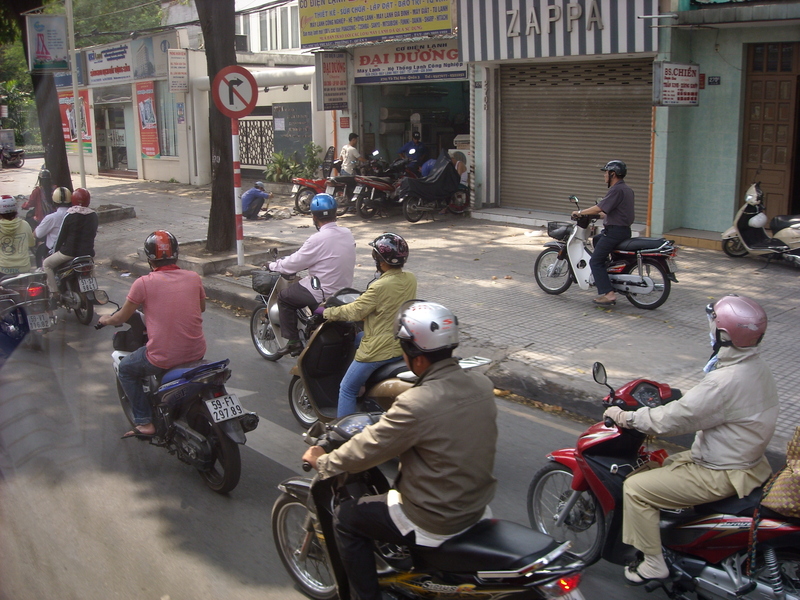 I truly enjoyed Ho Chi Minh’s organized chaos of shops and motorbikes here and about. I couldn’t get enough of the affordable, healthy, tasty food. And the best thing was really embracing and learning more about Vietnam and its culture through conversations with locals and being hosted by our Vietnamese homestay mom, Mommy Helen. Cam on (thank you), Vietnam for another memorable experience! Fuji Maru approached the s-shaped island and docked on Ho Chi Minh City, formerly Saigon. I’m a musical fanatic so I kept on asking people if they’re familiar with Ms. Saigon, the Musical. The story’s backdrop is Vietnam but even the Vietnamese don’t really know it. “Vietnam – Ho Chi Minh…” the song went on in repetitive, catchy mantra. Vietnam looks similar to the Philippines as most Southeast Asian countries are. And aside from rice being the staple food, the warmth, hospitality, and friendliness of the people are but a few of our commonalities. people and motorbikes alike rush by. Motorbikes and scooters are the main form of transport around here. So the roads would be swarming with them. Do as the locals do so like a real Vietnamese, we got to go around the city on motorbikes. Back home in the Philippines, I got hit by a motorcycle. No broken bones, just scratches and two lost teeth. I survived but I sort of developed a phobia simply from the sound of the motorbikes. I got over it eventually but destiny sure has a twisted way of confronting you with your fears. So as I held on for dear life, my host mom driving fast, which I believe is normal to them, I just prayed that nothing tragic would happen. I wasn’t prepared to lose another tooth. People would drive so close to each other that you could practically feel the air coming out from their nostrils. I observed that those riding with them make it look effortless even crossing their legs, as if they’re just sitting in a lounge chair. Some would be carrying babies and what-not. Other riders would strike a conversation with another. “Oh I’m riding my motorbike but hey, let’s chat and while we’re at it, let me just call someone on my mobile phone…” Crazy! But honestly, I actually had fun. And we arrived in our destinations in one piece. The Vietnam experience wouldn’t be complete without trying their famous noodles, pho (you should pronounce it with an upward inflection). It’s really tasty. And Vietnamese food is so healthy. They eat a lot of vegetables. No wonder a lot of Vietnamese, specially the girls, have Coca-Cola shape – the bottle, not the can. In Vietnam, you could be a millionaire. That’s because the Vietnamese dong, the country’s currency can be in hundreds and even thousands. The value is not that big but you can actually buy a lot. 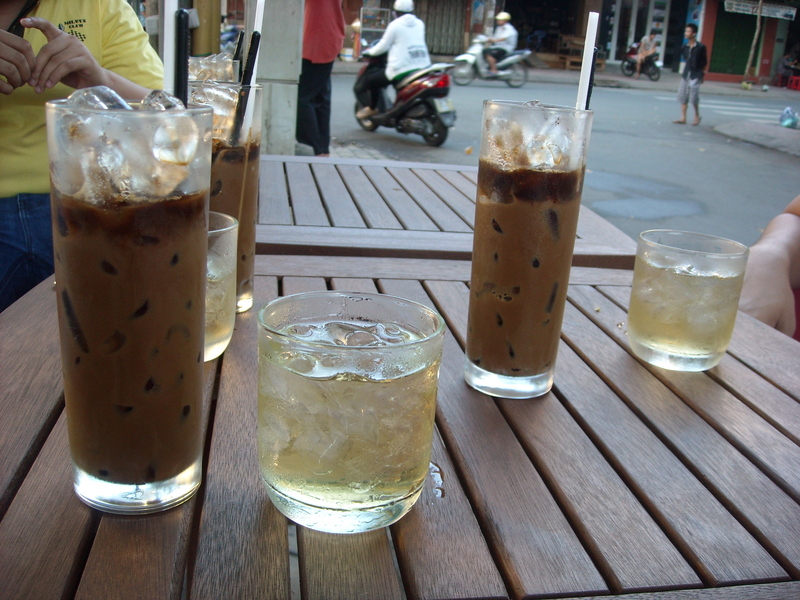 I bought so many boxes of coffee since most of my friends are coffeeholic and with that I could let them have a little taste of Vietnam.